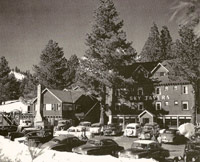 Sky Tavern boasts a rich and colorful history, one that includes appearances by many Hollywood movie stars, prominent sports celebrities, and some of the most noted contributors to U.S. ski history. In the years after World War II and during the early 1950s, Sky Tavern basked in the spotlight as a chic, intimate resort patronized by some of the most famous personalities of the day. Contemporary celebrities like Edward Teller, the father of the hydrogen bomb, and actors Rita Hayworth, Ingrid Bergman, Robert Stack, Gary Cooper, baseball legend Joe DiMaggio and others all found the Tavern experience exhilarating. The Sky Tavern's on-going Junior Ski Program was first established in 1948 when local skier and schoolteacher, Marce Herz, approached the original owners Keston and Carlisle Ramsey with the idea of reducing lift prices for schoolchildren and teaching them how to ski. 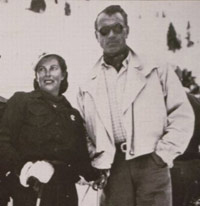 Herz, who went on to win the Nevada state ski championship in combined slalom and downhill in 1950, fervently believed that sports were good for everyone, but especially for children. Herz wanted to offer school kids the thrill and excitement of sliding down a mountain. Starting with six students, the innovative ski program Herz initiated has taught tens of thousands of children. Over time newer, larger, and more modern ski resorts opened around Lake Tahoe, places like Squaw Valley in 1949 and Heavenly Valley in 1955. Only a mile up the road, but with much steeper and challenging terrain, the Reno Ski Bowl began running chairs in 1953 at the Slide Mountain, site of today's Mount Rose Ski Area. They all siphoned off Sky Tavern's elite clientele, as well as their bread-and-butter local adult skiers. In 1959 the Ramseys sold the resort and eventually the City of Reno purchased the 143-acre property in 1968 for the exclusive use of teaching school children how to ski, and now snowboard too. In 1991 the City of Reno decided that it could no longer run the Sky Tavern Ski Program. A group of dedicated parents came together and formed the current non-profit orginazation that not only manages the program but maintains the Sky Tavern Area all year round. ?